The connection between people and the places they love is strong and enduring. The open fields, cedar forests and craggy shorelines of Door County are the backdrop to the shared experiences that shape our lives. These places are near and dear to our hearts and they say something about who we are. 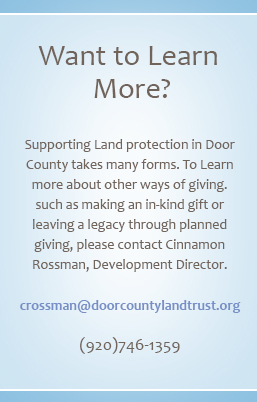 When you make a gift to the Door County Land Trust honoring a friend, family member, special event, or life of a loved one, your gift lasts as long as the land does – forever! 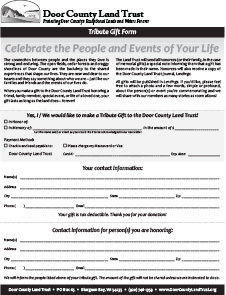 To make a gift to the Door County Land Trust in honor or memory of someone, Donate Online and complete the details of the tribute or memorial section of the payment web page. Print a Tribute and Memorial form. a special note informing them that a gift has been made in their name (but not the amount of the gift unless we receive instructions to share this information)- In the case of Memorial Gifts, family members will be notified. the satisfaction of being part of a solution to protect Door County’s most important resource… the land itself! Please feel free to send us a photo and a few words about the person(s) or event you are commemorating and we will share with our members as many stories as room allows!